Greg Diroff, age 62, passed away suddenly on Friday, October 5th, 2018 in Nashville, TN. 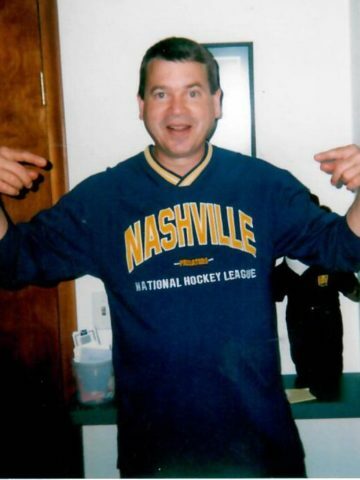 Greg was born and raised in Allen Park, MI and has blessed the Nashville community with love and laughter for the last 45 years. His overflowing generosity, sharp wit, unbelievable sense of humor, and endless compassion will be greatly missed by all who knew him. He is preceded in death by his parents Mary Helen and Lawrence Alfred Diroff. He is survived by his daughters and sons-in-law Laura Yankee (Jon), Emily Stefanick (Noah), Theresa Benedikter (Mike), Ruthie Wehby (Kevin), and his fiancé Joni Simpson. He also leaves behind 13 grandchildren who absolutely adored him and were adored in return: Benjamin, Delton, Jane Emily, Ainsley, Emery, Isaac, Olivia, Uma, Yates, George, Sebastian, Rachel, and Kayla. He will be greatly missed by his siblings, Mary Brennan (Bill), Pete Diroff (Tracey), Tom Diroff (Mandy), Leo Diroff, Bob Diroff (Raquel), and Ed Diroff. He leaves behind numerous nieces, nephews, cousins, and many dear friends whose lives he impacted more than he knew. Greg was always quick with a joke and loved to banter with anyone. He had a way of helping people laugh in any situation, good or bad (but especially bad). Fortunately, he had the ability to pull off his absolutely twisted sense of humor because of his impeccable timing and contagious laughter. He knew how to tell a story in a way that would make you laugh so hard your gut hurt. Greg was ever the prankster. Just last week, he designed and installed an inconspicuous “prank machine” at work to scare co-workers and capture their reactions on camera. This is just one of hundreds of stories that people have to tell about him. If you knew Greg, you couldn’t help but love him. Greg was the definition of the oldest brother from his youth through his last day. He was the responsible one, always helping his mom with his siblings. His "older brother" personality extended to all of the people lucky enough to be in his life. Greg would take a crying baby from a mother that he didn't know in church and walk right into the cry room. Who else could do that? His greatest accomplishment in life was raising his four daughters. Greg spoke constantly with utmost pride about his girls and their families. He was the best mentor and friend to the sons-in-law that loved him like a father. He was a fixture at family cookouts, grandparent’s days, Baptisms, and birthday parties. If it involved his children or grandchildren, he was there. He is already missed more than one could imagine. You never forget your friends no matter how long its been since you had a chance to say hello. Greg was someone who I always enjoyed being around, at Mike Currans condo in Belleview or at the softball field in West Nashville or at the farm on Sams Creek. Will miss his smile and friendship. To Ann and his girls Gods Peace and Grace. Rest Well Old Friend. I have enjoyed working with you the last 2 years. I will never forget the first time I ever heard of this guy from Michigan, named Greg Diroff, that my dear friend Ann had met while on a spring or summer break in FL when we were in high school. I may be wrong, but, I think it was during our junior or senior year. I was so impressed that this guy Greg hitchhiked from Michigan to Nashville to come see Ann after meeting her at the beach. Wow! What a guy!!! What an accent, what a laugh and a goof ball sense of humor. He fit right in down here in the south. The rest is history! Many fond memories of Greg. Here’s a few: steeplechase, cooking to death his chicken on the grill(LOL). It improved finally thru time☺! New years Eve parties, you driving that van. Greg was the only person my daughter immediately would stop misbehaving, when it was time to go home after playing at their house. “Erin, Cut it out! listen to your mother”!!! She did! God bless you Greg. One more thing. my favorite place at my home is my deck he expanded, as well as my fencing he put up. Thank you Greg. It still brings me so much joy and many memories have been made out there. RIP my friend. Hope to see you again someday! God bless all of your family. Your daughters and grandchildren especially. You will be missed terribly. From John. Too many to list, but one that sticks out… he and John were driving down Charlotte, Greg says, “Oh! Look! Roadkill! …..Oh! Hell! That’s my cat!” Much funnier in the ‘Greg’ voice. Loved Greg! One of a kind for sure! My whole family grew up with the Diroffs from Allen Park. We were the Diroffs from Taylor/Southgate. My cousin Tommy (Tucker) was Greg’s younger brother and the two of us were inseparable. Greg was the older brother who knew better but did not scorn you. Always ready with a little direction but a laugh to go along with it. In the past five years we have been fortunate enough to have a few family reunions and rekindle our spirit from our youth. We screwed up this year and missed another chance together. When you are 7, a 12 year old cousin is a lifetime away. When you are 57, a 62 year old isn’t far at all. Our thoughts and prayers are with you. I think that my favorite memory of Mr. Diroff is how much that he loved his children. He was so proud of them at SCA! He will definitely be missed, nobody can do the laugh he had, if you were anywhere you would know for sure if Greg was there, he was the star of the Party. We love you Greg. When Laura and I were dating about 12 years ago, we bought a house over here on the Eastside in what would be called an “up and coming” area. One of the first of many projects he helped with the house was to help me build a back deck. There was an alley directly behind our back yard. We were working one day and a car flies down the alley going about 50 or 60 mph. Then about 10 seconds later an undercover cop with lights blazing sped by chasing it. He turns to me with a big grin and says “Jon, you don’t have to watch COPS here, you can watch it off your back deck” then laughed that great laugh he had. Diroff Family so sorry for your loss. I can remember all the parties and the loud music. My dad and your parents betting on the Tigers for the fun and the bet was a dollar. There was always a lot of laughing. My parents were sad when your parents passed away. There is only a few of the original neighbors from the time we all lived there. Lots of great memories from growing up on Laurence St.
My favorite memory of Greg was sitting at the house up on the hill. My son always remembers Greg for all the laughs he provided us and pranks he played. I will truly miss my friend, he was the reason I met my best friend Ann and I loved working with him at Kroger so many years ago. Peace my friend and be happy knowing you have raised the best girls. I love you. I grew up across the street in Allen Park from all the Diroffs. Greg and I were only days apart in age, he going to Cabrini and me going to public school. He had a great personality and was a jokester frequently. We all grew apart in our adulthood, but I have often though of all of them. Greg and I had our kids about the same time, but only got to meet his first couple girls. Im sure he will be missed greatly by everyone and thinking of you all in this time of grief. Remember all the fun times and his infectious laugh! Greg, was always there for me. When my Mom died and we we’re in the process of fixing her house up to get ready for sale. Greg came by the house on his lunch break and crawled under the house with me and helped put wires up to hold the installation. He was always there for me, Greg hired me at NHC in housekeeping/laundry, just so I can make ends meet with financial situation. your going missed very deeply, but you will always remain in our hearts. Make sure he carries that Ping driver to heaven with him. He has a lot of golf to play with Arnie. We will see you wednesday. He loved his golf games with you guys and all his golf buddies over the years. Such a big part of him. Thank you guys so much for the friendship you had with him. What a beautiful, loving tribute to a man who will be missed by his family. I am saddened by your heart breaking loss. Please know that I am thinking of you and praying for peace, and the comfort of your wonderful memories to ease your grief. I have many fond school memories of the Diroff family. Greg was a fantastic guy. He was funny as hell, and had a great sense of humor. No matter where you were, if you heard that laugh, you knew Greg was near. He took care of his friends. He deeply loved his daughters. Greg was one of the finest friends you could ever asked for he had a heart of gold and a great sense of humor. He sure will be missed on Wensday afternoons with all his golfing buddies. Thank you Greg Diroff for the love and friendship you showed to me and my family. The Notre Dame and Michigan games won’t be the same without you. You will be missed Bob D.
I loved working with you these past few years. Right up until the last day I saw you, you were having fun and playing practical jokes. I always laughed when I was around you. You worked harder than most guys half your age and were always generous to everyone. When my battery ran down on my car, you showed up to jump my car off within only a few minutes of calling you. That’s the kind of guy you were. I will miss you my friend. To the Diroff Family I am sorry for your loss. Thoughts and prayers go out to you. I’ll always remember the fun camp outs we had had his house off Highway 100 next to Harpeth Hills. Greg and i shared many good times together.We did a lot of jobs together over the years. The times we spent at Birdsong on the water and camping were some of the best times in my life.The Notre Dame bus trips would not have gone on if it werent for Greg. He was the first one off the bus setting the tables up pulling the grill out etc. Greg would be there to help you anytime you called.He will be missed. I will keep the family in my prayers. Good man gone too soon! RIP Greg . I wish I could remember jokes and stories like so many others on here, but never has been a strong trait for me. I do know today is Thursday and I have to face the fact that I have been dodging, I won’t get to see or here my friend anymore. Greg was like a bite of exotic food, you know, the kind that bursts in your mouth with so many flavors. Although I’ve never experienced anything fancy, other than a Big Mac! He was funny as hell, always kind and helpful and if you needed anything, he would try to make sure you got it. He also had a good serious side too, so don’t stretch him to far! But he was at his best on the golf course on our Wednesday playing days. He could go from from one extreme (funny) to really serious, actually mad as hell, because he missed that par or birdie, but always the greatest to play with. I loved it! Greg was family, he was a good friend and he was my golf buddy. I will miss my buddy, Wednesdays will never be the same. I can’t imagine what the girls are going through. I pray for them. Greg was a good friend of mine through eighth grade until he moved to Nashville..I remember spending the night with his dad after his bachelors party in a nice cozy cell.Greg was a lot of fun to be around and I will miss him.my condolences go out to his current friends and family.He will truly be missed! Our hearts are heavy over the loss that you have suffered. Our loving Creator wants to comfort you with his promise that, “God…will wipe out every tear from their eyes, and death will be no more, neither will mourning nor outcry nor pain be anymore. The former things have passed away.” (Revelation 21:3,4) May this promise bring you comfort and hope.